Welp, we did Willie the Wildcat to kick off last year, Big Jay and Baby Jay toward the end of last season, and now we have the last of the big Kansas City area school mascots in Truman the Tiger. Recently named after a famed president, not Taft, and hailing from the University of Missouri, Truman’s past comes from a long line of feral felines. Today we’ll find out what makes the furry guy tick and also offer some improvements to his already super sized personna. 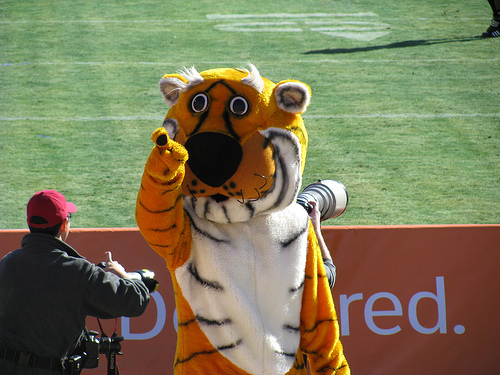 So kick back, relax, and come with us on our second year of Mascot Monday with Truman the Tiger. Wrapping up Big 12 Media we have K-State and Bill Snyder still angry about the audits after Jon Wefald left. Bill, it happens after every school president leaves. Relax. The sad thing is people are talking about that and not his return at the media days. Maybe he is spending too much time keeping up with technology. Colorado coach Dan Hawkins backtracked from the 10 win guarantee and stated that it was a challenge to his team to win 10 games. There is no way he is going to achieve that goal. The way the North is looking in the Big 12 and the toughness blowing up from South, it would be hard pressed for this Buffalo team to compete. Sergio Kindle from Texas made a surprise appearance at the media days. Awhile ago he crashed a car into an apartment complex apparently while texting. We think he was drunk. He got away and Mack Brown will make sure he leaves the phone at home from now on. Big 10 media days happened as well. The big surprise is they might adjust the schedule to pad some games at the end of the season. They need that to actually compete in the big bowls that happen around the start of the year. The not so big surprise is that Joe Pa is not going to retire soon. Steven Sipple seems to be the only one crying about the new Cowboys Stadium in Texas. He makes a good point but the massive complex might help draw more money for the league. Yes, it would continue the South slant perception in the Big 12, but that’s a perception and not a reality. Hawaii coach Greg McMakin apologized about a remark he made at the WAC media days when the Rainbow Warriors played The Notre Dame Fighting Irish in the Hawaii Bowl. He essentially said the Fighting Irish danced like they were little things that the British call cigarettes. Yeah, he probably shouldn’t have said it in a press conference. But it’s a little ridiculous that he is now suspended for 30 days with no pay. Looks like Jake Trotter polled 29 of the 38 football players at the Big 12 media days and found that Ralphie is the most favorite mascot, followed by this week’s Mascot Monday entrant Bevo. We here at the KCCGD think that maybe the football players polled should take a better look at some of the local talent (Willie the Wildcat, Truman, Big Jay, and Baby Jay) before they plunk down their choice. When Lee Corso suffered a stroke in May, everyone thought his career would be over. Well, not so fast my friends. The former coach and now goofy commentator is hitting the weights hard to get ready for his return to College GameDay on ESPN. Good luck, Lee. Looks like Oklahoma will be playing Army for a 2 game series in 2018. No, they won’t be playing at Yankee Stadium, it will be at each team’s home field. We’re gonna go out on a limb and say that Army will be competitive by then, either from the Black Knights rising or the Sooners dropping. Hopefully they’ll keep those cool camo uniforms for the game. 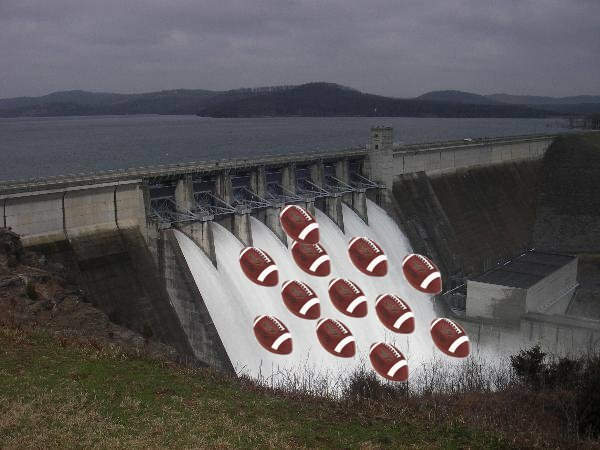 It’s the after 4th of July recovery and we’re inching ever so close to the start of the 2009 college football season. 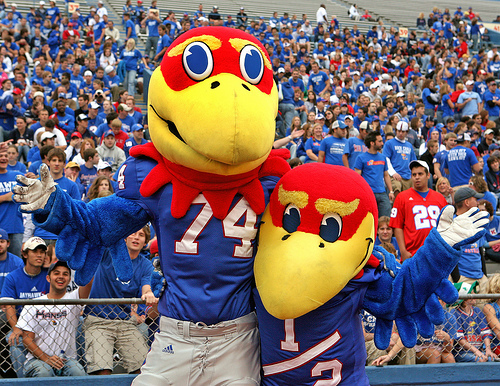 Since we are getting close and Mascot Monday is reserved for the off season, we are going to profile the mascots of the Big 12 teams favored to win their division, starting with the Kansas Jayhawks very own Big Jay and Baby Jay, with the other Big 12 team coming next month. A Jayhawk has no known animal classification, but stands for something that happened before the Civil War. We’ll figure out what they were thinking way back when and lay a couple of eggs on the way. Get ready, Kansas City, here’s Big Jay and Baby Jay.